Defy Water Repellent for Brick is a masonry waterproofing product designed to prevent water penetration while remaining 100% breathable allowing water vapors to escape, preventing costly chimney repair. DEFY Water Repellent for Brick is a modified siloxane based product designed to penetrate deeply in to most masonry and concrete pores. Unlike acrylics, silicones, and other waterproofing sealers that remain on the surface and trap water vapors, this masonry waterproofing product allows deep penetration of its active ingredient of up to 1/4 inch or more. As a result, the special siloxanes in DEFY Water Repellent for Brick react to form strong chemical bonds beneath a treated surface. These bonds allow the product to become a physical part of the structure and provide long-lasting water repellent protection without altering the appearance of the brick. Moisture, from either internal or external sources, is usually present in brick, masonry, and concrete. A DEFY Water Repellent for Brick treatment is 100% vapor permeable, which allows the water vapors to escape. This reduces costly chimney repair such as spalling, scaling, deterioration, and freeze-thaw damage that results from trapped moisture when clear coatings and water sealers are used for waterproofing brick. 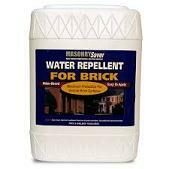 DEFY Water Repellent for Brick is sold in 1 and 5 gallon containers. Each gallon covers between 90-150 square feet. If surface has been previously treated with a waterproofer, use DEFY Solvent Base Water Repellent. From Vasiliy of Elkhart, Indiana on 5/3/2016 . From RICHARD MALONEY of TANNERSVILLE, Pennsylvania on 9/2/2015 . From Robert T of Rotonda West, Florida on 6/16/2014 .